I’ve liked riding dirt on road bikes for a while: blame Grant. I’ve done it with lots of people and enjoyed coming upon a group of riders on full suspension MTBs and kinda smugly shrugging that we rode on the same trails. While “gravel biking” garners chache by the mainstream industry, living in Southern California, a bona-fide mountain bike sure is fun over the rocky, technical trails. I’ve long admired the Moots YBB for its craft and simplicity – the “soft tail” harkened back to my rigid MTB days in college. So, when I found one on the local Craigslist in the summer, I dove in. 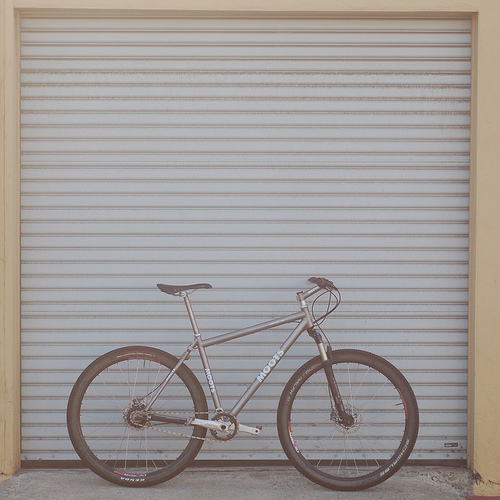 This one came with a Rohloff, Hope brakes, Moots post and stem, Chris King headset and front hub, and some nice tires for a complete bike. More bling than I was looking for, but I’ll take it. 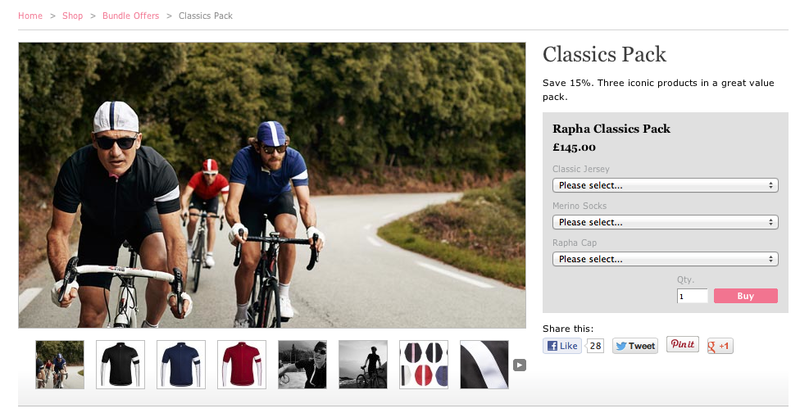 Rapha – clothes as good as the videos? Author richdirectorPosted on February 26, 2013 February 25, 2013 Categories bikes and cycling, Equipment & Reviews, Road bikesTags cap, classics pack, Rapha, shirtLeave a comment on Rapha – clothes as good as the videos? It seemed that for the third year in a row I wouldn’t finish the race. The previous two years’ editions had been brutal, not for the distance, elevation or even the gravel – but rather, the heat. The starting point for this year’s NW Rapha Gentlemen’s Race was the small ski town of Government Camp, near the base of Mt. Hood in Oregon. The snow capped mountain has watched over every Rapha Gentlemen’s Race since 2008. It would also serve as a magnificent landmark to gauge where we were on our journey that included 122 miles and over 12,000 feet of climbing. 26 teams from all over the western States had signed up for the adventure and, as is to be expected with such events, every rider was in for a day to remember. Our team’s 08.24 scheduled roll out was a blur of chamois cream, stuffing pockets, tire inflation and hi-fives. Scheduled because it turns out a member of our team needed a few adjustments to her bike and so, around 15 minutes and one team photo later, we were finally on the road and all systems were go. No problem. With the free miles ticking over as we dropped down the mountain, I took a second to absorb this long-awaited moment. There’s nothing better than actually getting on the bike and riding after a few weeks of lead-up – no more prep, no more thinking, no more counting down the days. We were on, and everything was as it should be. During the week there had been talk that this course was going to be “tough,” with “more gravel and elevation than other years,” which can lead your thoughts in one of two directions: You can begin to question why you’d want to suffer for nine-plus hours or alternately, you can crave the abyss of possibility knowing that it is days like these that are the core of why we ride. This was the first time the six of us had ridden together, yet it felt like a natural fit. Named after the acclaimed online cycling journal Tenspeed Hero, our team included: the Texan of Wooly Mammoth fame Patrick Newell; photographer Dan Sharp; Joe “no brakes!” Staples; French import and Rapha-FOCUS cross pro Julie Krasniak; the nicest-guy on-two-wheels Clint Culpepper and yours truly. Not a bad half-dozen. Aside from Julie, we all had a few of these rides in our collective saddle packs and knew that the key to a successful Gentlemen’s Race is simple – cohesion. It takes six in to win. This was a mantra we’d agreed to subscribe to before we set off and, given the unpredictable nature of a Gentlemen’s Race, would serve us well throughout the day. However we rode: two-up, fast rolling turns, attacking the climbs or off the gas, we were in this together – one unit, with six moving parts. In addition to cohesion it also helps to be able to follow a cue sheet. This was proven not once, but twice by a very eager team: After they pace-lined past us down Hwy 30, we jokingly reminded them of this fact after they came by again, having missed the first turn. A few miles on we reached the crest of Lolo and began our descent along a narrow road bordered by lush green Doug Fir pines. 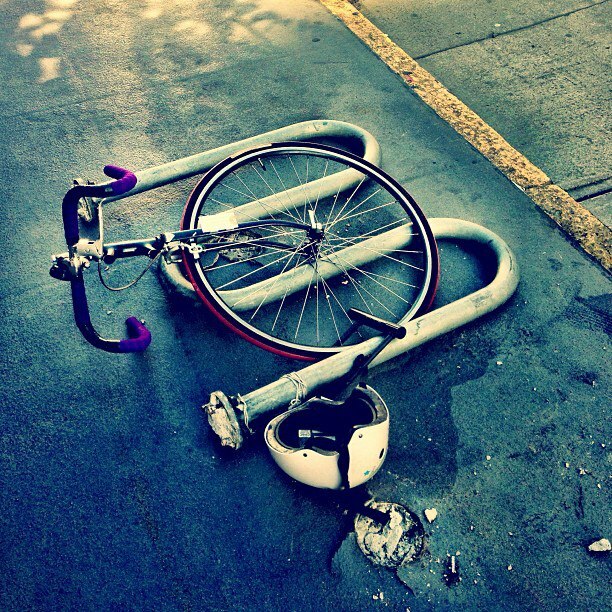 Patrick rolled up to Clint and thanked him for preparing his new tires earlier in the week, then, not more than a minute later – ‘pssssssh’ – he punctured. During the repair the Wooly Mammoth team flew past, hurling the mandatory jokes as Rapha Racing and last year’s winners, River City, took up the chase. We pushed off and continued bombing down Lolo’s backside, eager to make up some time. The short, punchy climb of Ten Eyck Rd stood between us and the first designated pit stop in Sandy. Conversation disappeared as we linked up with Team Beer and tackled the high-grades at our own rhythm. ‘Pssssssh’ – Patrick chalked up number two. While he took care of business, a gang of Mods out on a joyride strangled their scooters up the steep incline and for a second it felt as though we’d been transported to the English countryside. Moments later we rolled into the first designated checkpoint and stocked up on food and water. One team had even arranged a truck (yes, it was an actual truck) of supplies, and in the spirit of the race they were only too keen to share. It seemed that for the third year in a row I wouldn’t finish the race. The previous two years’ editions had been brutal, not for the distance, elevation or even the gravel – but rather, the heat. No one had trained for nine-plus hours in 110F and all but a handful of riders were forced to cut out the final climb. This year was different: cloud cover and 70F meant that conditions were ideal. While I rapidly processed my options (single speed the final 65 miles?) Dan and Joe wheeled over the hill. “Is this what you need?” Amazingly, they’d found the culprit: a ¼” screw that had ejected itself 100 yards earlier. We were back in the game. Seeing as I was riding on borrowed time, I figured I owed the team for keeping our quest alive and decided to get on the front and pull us to the foot of the final climb. This 14-mile gravel section was designed to test each team’s doggedness, and in true Gentlemen’s Race fashion, would begin at the 104-mile mark. We hit Still Creek Rd, buoyed by a bonus section of paved road and a sunlit forest draped in Spanish moss. But the wonderment was short lived as the road deteriorated to a narrow, potholed 4WD track. It was time to let the dog off the leash. As we strived to float over loose rocks the path’s invisible hand pushed us back down to a grinding, seated climb. Then about halfway up, deep in the middle of nowhere, we heard yelling and clapping. And as we rounded a corner we discovered a gang of friends from Portland. Beer hand-ups, shouts of encouragement and maybe a push or two were just what we needed to motivate us towards home. Crossing the line in formation I wondered what it must feel like to actually win this race. Sure, there’s pride on the line, the good fortune of being invited, a year of having it over the other teams and the sense of accomplishment knowing you took on the parcoursand won. For now though, we were more than happy that we’d finished. In fact all 26 teams did – a fitting testament to the stunning course design. And once again, River City Bicycles took home the biscuits. If you’re fortunate enough to be a part of a Gentlemen’s Race, heed the advice best summed up in two words Joe had written on his hand – ‘chill out’. After all, it’s only a race. 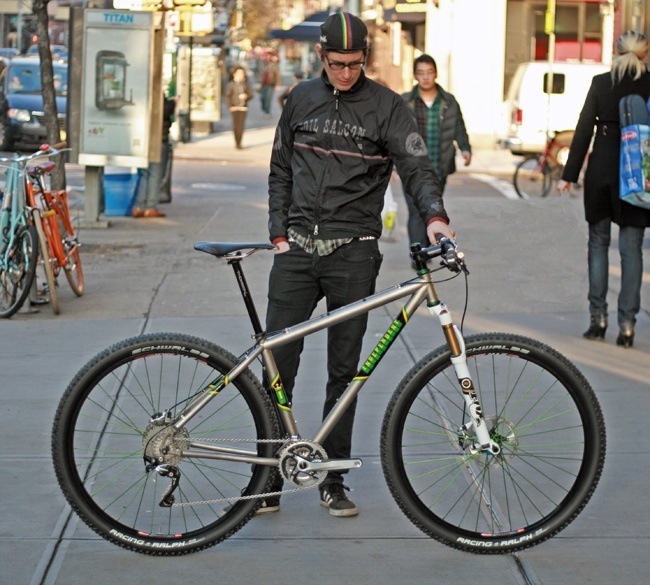 Maybe it is the dashing NY velo man but this bike is really the style leader of the two. Love my bling ti bikes as you know. I don’t just build bikes I create masterpieces.